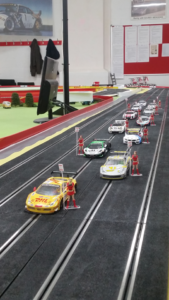 South Manchester Slot Racing opened it;s doors for the return of DiSCA GT3 Euroseries after the inaugural GT3 Open event held at the club in 2016, kicking off a brand new formula for the association. 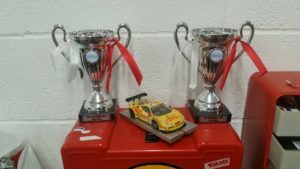 The clubs’ wooden replica of the Circuit de Catalunya played host to the GT3 machinery once more as team Rockingham had their eye on doing the double for the second consecutive event. After qualifying that looked a distinct possibility as it was the DHL-emblazened Ferrari 458 of the Northants club that topped the timesheet, followed directly by the sister car of Rockingham racer John Underwood who was racing with his son Ben for the first time. 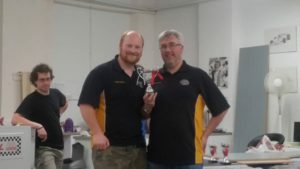 Following behind was the Alexrims McLaren entered by the DiSCA team of Gary Skipp and Alex Jones, and series debutants Llantrisant Slot Car Club who put in an impressive 5th fastest time of the session with their brand new Porsche 991 RSR. Unfortunately for the enthusiastic Welsh team the car was found to fail minimum ground clearance checks during post qualifying tech. Nothing too serious however, and all was set straight during the lunch break. The racing action was extremely close with a surge from the WHS McLaren which only managed to qualify mid-field. The brand new car was one of the strongest on the circuit in the hands of Ricard Hill and Steve White, putting manners on the established form of Demon Slot and Rockingham by holding the lead during certain stages of the first 60 minutes. In the end it would be Rockingham who would pull clear, leaving the fight for second between the two McLarens of WHS and Alexrims, who had begun to edge away the BMW of Demon. In the end the Leicestershire duo held on from the DiSCA boys and took second place by one lap, and only one behind the winners Le Maistre and Tucker. Race 2 was the reverse grid which would see the Porsche of Llantrisant take the pole from the father/son team of John and Ben Underwood. Fortunately the Welsh pairing of Gibbons / John had a much stronger race second time around and would eventually hold on for 6th, matching their early qualifying pace. The top five were all about Rockingham, Demon Slot and the McLarens to repeat the nail biting action of Race 1. Both the Demon BMW and Porsche of the Demon Rosso team would sit among the top three during Race 2 but it was an excellent opening stint by Alexrims driver Alex Jones which would see the McLaren leading at the halfway mark. After driver changes it was down to Skipp to chase down the Ferrari of Rockingham, while being it was WHS and Demon Slot fighting over third. Eventually the BMW would take the podium earning the first trophy of the day for Phil Field and Craig Jones. 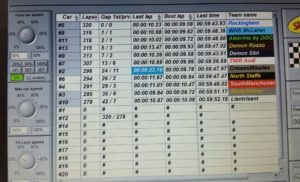 Skipp would indeed catch and pass the leading Ferrari with three minutes to go, but a mistake at the final chicane saw the Rockingham maestro slip back through into the lead. 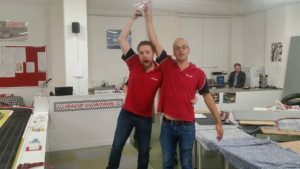 In eager pursuit, a mis-marshal by Matt Tucker saw him tumble from his stool on the infield and from that point there would never be a chance to close the gap – Rockingham would hold it to the flag. Great entertainment and the closeness of competition was enjoyed by all! Overall a repeat display of dominance from team Rockingham, who’s Ferrari was on pace all day. 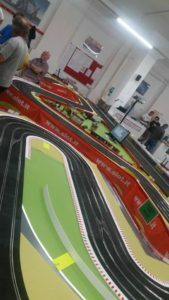 Notwithstanding the skill of drivers Matt Tucker and Adam Le Maistre, who continue to impress as the series progresses. The next GT3 Euroseries event will be on home soil for these boys – Rockingham on 11th November. ERROR: Error validating access token: Session has expired on Thursday, 04-Oct-18 08:02:04 PDT. The current time is Saturday, 20-Apr-19 17:52:17 PDT.